will be performing in conjunction with Play on Philly on March 24th. Concert will take place in Field Hall at the Curtis Institute of Music. There will also be a guest performance by Elizabeth Hainen. 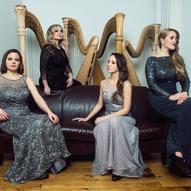 The Chicago Harp Quartet, founded in 2012, has quickly established themselves as the leading harp ensemble in the United States. Widely regarded as a Chicago treasure, the Chicago Harp Quartet has dedicated itself to presenting innovative, charismatic and forward-thinking programs of existing classics transformed for the ensemble as well as new commissions. 2015 is a banner year for the Quartet with premiers at Carnegie Hall and the Kennedy Center, educational residencies with Play onPhilly!, New York University and Jacobs School of Music at Indiana University, return performances on both the LIVE from WFMT and Lyon & Healy Festival Concert series and an exciting multidisciplinary living art gallery project with Mozawa and Ho Etsu Taiko. The Quartet looks forward to premiering new works by composers Alfredo Rolando Ortiz and Nicholas Davies.